Looking upwards into trees as they shed their leaves in storms of approaching winter, it is difficult not to be fascinated by sometimes huge bunches of mistletoe, growing out of many an apple tree or hazel; ash or willow or sometimes even an oak. Long before its kissing fashion, indeed since very ancient times Misteltoe has been prized by Druids, for whom it is a magical plant, not of the earth but growing between earth and sky, so that it forms a mystic link between them. 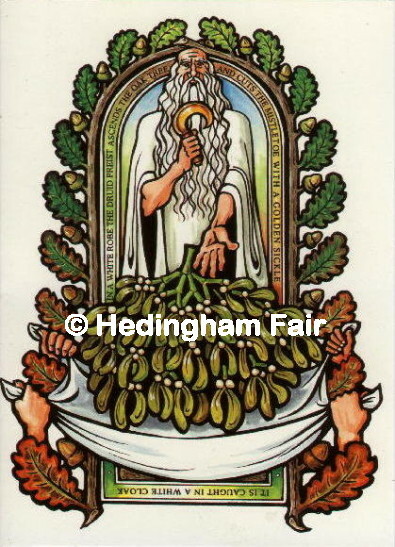 As the oak tree is also sacred to Druids, mistletoe found growing from an oak tree is doubly sacred. The illustration draws inspiration from the Roman author Pliny, who writing in the year 249 described a Druidic ceremony in which the priest clad in a white robe, ascended the tree and cut the mistletoe with a golden sickle, before passing it down to be caught in a white cloak, so that it should never touch the ground and remain between earth and sky.